We are living in the era in which live performance is one of the few opportunities within that music business that sound and music is able to directly interact between the artist and its audience. Vital to this interaction are digital devices and consoles, something which constantly drives us forward to understand and test these technologies deeply. 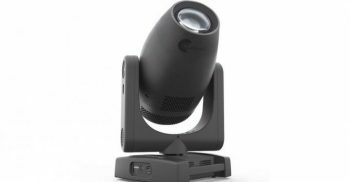 Today, the focus of this attention lands on Allen & Heath, a company that has been present on the market for many years and has gained a vast number of fans along the way. The company recently released the new series of D-Live S-class mixers, devices that we put in the expert hands of Nicola Trapassi, for two days of full-on testing. The D-Live S-Class was born to give the opportunity of creating a flexible and customisable mixing system. 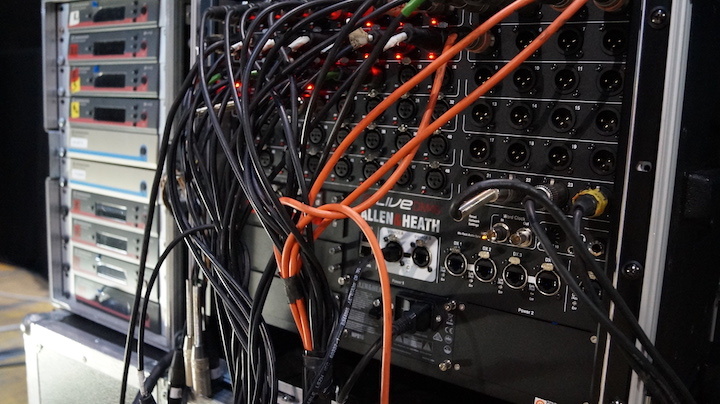 In doing so, Allen & Heath aim to provide a device that can manage the most demanding of live scenarios, whilst simultaneously providing quick and intuitive tools that allow the user to keep everything at their fingertips. All this with the intention of allowing the user to concentrate on the live experience that they are creating, rather than simply the process of mixing. 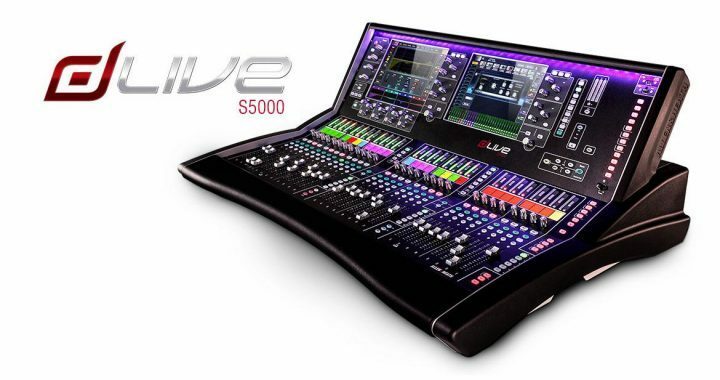 Thanks to the kindness of Exhibo, the national distributor of Allen & Heath, we had the opportunity to try the new D-Live S5000 in a intense two-day session. This was one which was a credible example of a common situation for small-medium rental companies, and, judging by the workload for these two days days, for even bigger companies too. The dLive certainly takes a step forward in the world of digital mixing that Allen & Heath offer, by innovating upon the technologies of the company’s previous mixers. New performance capabilities, achievable thanks to the console’s XCVI core, allow for a new platform that incorporates the DEEP processing suite of embedded plug-ins, offering an improved workflow thanks to the integration of touchs-creens and practical controls. At the beginning of the project, an A&H Product Specialists told us “it was clear that we could not achieve this goal with the traditional DSP technology. In fact, some of the limitations of DSP such as the “I O” on the chip, the fixed number of cycles and consequential problems with the latency and routing management, placed too many limits on the team. Because of this, it was decided to switch to FPGA (Field Programmable Gate Array), a programmable integrated circuit that allows for the realisation of highly complex logical functions “. With this new FPGA technology, the mixer manages 128 input channels across 64 mixes, all with a 96 kHz sampling rate. The new processor, with 36 parallel virtual processing cores, is able to execute more complex algorithms without any real architectural limitations. 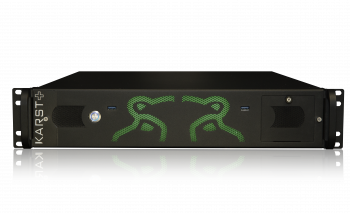 Within the same XCVI processor, six parallel mixing engines can calculate over 10,000 cross-points per sample, whilst the router is capable of 3,000 x 3,000 audio paths. This yields an factor that’s eight times higher than the previous Allen & Heath system. Another advantage is the sum coherence, something which can all too commonly have evident effects on the final sound result. Thanks to the XCVI core, each internal path is aligned on the output within a maximum latency of just 0.7ms. Another important factor for Allen & Heath is the emulation of classic modules, such as FX units and processors, thanks to DEEP processing. This is an architecture that, through a series of customised algorithms, faithfully reproduce these timeless hardware options by capturing the audio nuances of both vintage and modern compressors. From a structural point of view, we found the dLive to be compact and not too heavy: C Class has 28 faders on 6 customisable layers that allow you to have always everything in sight, working in harmony with the visual feedback of its two touch screens. 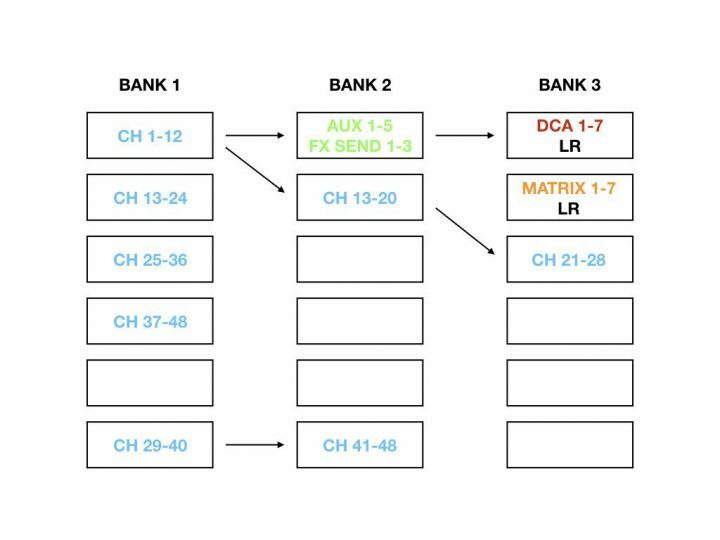 Each channel, both input and mix (Aux, Matrix or DCA), can be assigned to the bank of any layer and named and coloured via the scribble strips located near each fader, thus allowing the user to work easily and with easy identification of tracks. The main goal of Allen & Heath when creating this console was to create a surface that would allow the user to concentrate on the mix, rather than on the mixer. D-Live S5000 is equipped with two touch screens 12” that are clearly visible in all light conditions and very sensitive to both single touch and the most common gestures that we have grown accustomed to in our daily use of smartphones. This includes gestures such as pinch, swipe and drag and drop. In fact, thanks to the Harmony interface, interaction with the D-Live is immediately familiar and intuitive, responding to every pinch, slide drag and releasing exactly as we are used to in our everyday interactions with technology. Thanks to the configurable “widget” areas, as well as the management of the Layers and the 26 assignable softkeys, the mixer is incredibly versatile and suitable for a plethora of live sound situations. Around the screens, moreover, we can find a series of quick controls for the basic functions such as as equalisation, compression and gate. The console is ideal for both touring and installation in live music venues, aided further by the D-Live’s integration with Allen & Heath’s MixRack system, available in DM32, DM48 and DM64 configurations. Each Mixrack can be shared by 4 surfaces simultaneously with Automatic Gain Compensation. Expansion cards are also offered, with a 128 I/O 96Khz SuperMADI option in addition to the classic MADI option. The 96k/96bit XCVI core allows 128 inputs with full processing and 16 dedicated effect returns, for a total of 160 mixable streams and 64 configurable buses. With D-Live, A H has moved away from the ACE protocol, switching instead to the more modern GACE. Despite this, communication with previous mixers and peripherals (such as the iLive world) is still possible through an ACE expansion card. It is worth noting, however, that MixRack and dLive control surfaces are not in any case compatible and interchangeable with iLive systems. The expandability currently allows for connection with networks such as Dante, Waves SG, GACE and MADI, in addition to a fibre optic system, which is still under development. The system is compatible with the MixPad and OneMix apps, in addition to the online/offline editor. Our test took place in one of the most challenging conditions in any live environment: a two-day Band contest with an average of 10 performances per night complete with stage changes and patch changes. After a quick first glimpse into the Extrapalco warehouse (the rental company which followed the event and that was available to host us) I immediately realised that the approach to the desk would have been simple and intuitive. 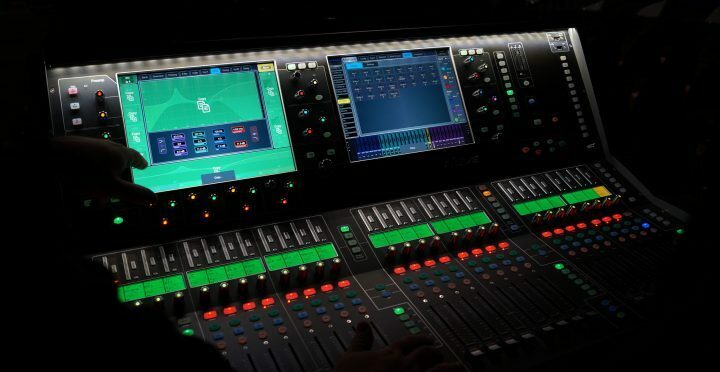 The economics of the contest involved the use of a single mixer and this allowed us to fully exploit the potential of the D-Live, which also managed the monitor sends on stage. The S5000 was connected via a 50m CAT5 to the DM48 MixRack placed on the stage from which we managed all the In and Outs including the LR. On the surface itself we additionally used some of the physical channels on board, for example to connect a PC that played background music during changeovers, alongside two Matrices for the audio send to the cameras. Thanks to the Layers, I had the possibility to set up the desk in order to have everything in sight, avoiding loss of time during soundcheck and during the show. Below is the outline of how I organised the 3 Bank Layers. For soundcheck, I spread the Inputs as indicated by the diagonal arrows in the diagram above. In this way I had the complete view of the channels and faster access when managing the monitor sends in Flip Mode (Mix Mode for Allen & Heath). Through the show, however, I used the S5000 as indicated by the horizontal arrows at the top, working mostly with the DCA. Obviously, as already mentioned, this was my own personal work setting, but the desk is open to any kind of configuration without any limitation beyond the physical layout of the faders. I found several nice ideas designed to simplify the workflow, in particular the graphical RTA screen that appears when any channel is in PFL. Another interesting aspect is the Mix Mode we talked about before. Since the management of the layers is free, each fader has, in addition to the classic Mute, Sel and PFL buttons, a Mix Button, one which has a varying function depending on the nature of the reference channel. If we press the Mix button on the fader of a Aux, this, as in all mixers, will flip the input channels. However, if we press the Mix button on an input channel (for example on the voice channel) this will flip the faders of the Aux showing their send. I found this feature really useful in cases where you have to change the level of a channel on all monitors simultaneously, something that in these “battle” situations is a godsend. In order to weigh everything up fairly, I can’t forget some of the less intuitive and rapid aspects of the system such as Pre/Post Global assignment of auxiliary sends that, despite the relative Pre (+ Sel) buttons, happen exclusively through a combination of keys that I understood only after consultation with a product specialist. In terms of processing speed, the only slower point I found was when wanting to turn two Mono channels into a Stereo. In these instances, the surface seemed to have a block of about 15 seconds. Obviously, most of the time this operation is carried out during the development of a project or in any case during the preparation of a tour, therefore it can be considered negligible. The switch-on time remains in the average of other mixers and is about 40 seconds, a value that is all in all acceptable. Working on the D-Live S5000 actually allowed me to rediscover the spirit described with which Allen & Heath designs their consoles. 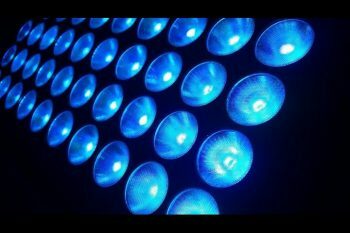 The resulting sound was round and powerful, something which is certainly thanks to the new technologies used and workflow that is created by these.